End of sprint 2, already at the halfway point, arghhhhh! Insights have started fitting together this sprint, however, it feels like we may have bitten off more than we can chew to be ready before we present at UX Bristol. This isn’t necessarily a bad thing. This discovery is more than just having something to present at UX Bristol, but having this in the calendar does provide just the right amount of pressure to get things done. We’ll be de-prioritising some of our activities to be put on ice until after the conference. Fortunately what we are uncovering is great, and so fear not UX Bristol attendees we’ll have plenty for you. Analyse the data that we gathered from the interviews of participants in the previous sprint. For the majority of the time Nic and I are actually working remotely from each other. This has been fine up until the point we attempted to conduct the analysis of our participant interviews on a rainy Tuesday night. We attempted to analyse our insights, although we had problem – geography. I was in a Travelodge looking over Southwark train line, Nic was in his office with a household to see to bed etc. Added into the mix the conundrum of where the data is, Nic had the raw notes whereas I had a bad quality picture fo them. We started, I kid you not, with me reading out the raw notes I could see on a picture taken from the session with Nic typing them up into bullets so we could group them and analyse them. This lasted 10 minutes before we realised that actually that idea was awful. In an ideal place, we would have digitised our notes, and raw data and worked from there. The problem was we were digitising, analysing and it was late. So what did we do, Nic mapped out the raw notes of 3 participants on his whiteboard, whilst I read all notes from pictures and analysed the other 2 users. We then convened, shared what themes we were distilling from the data. This proved to be highly effective and we ended up with a bunch of views hypotheses and questions for our next round. Bingo, We got to bed past 12. 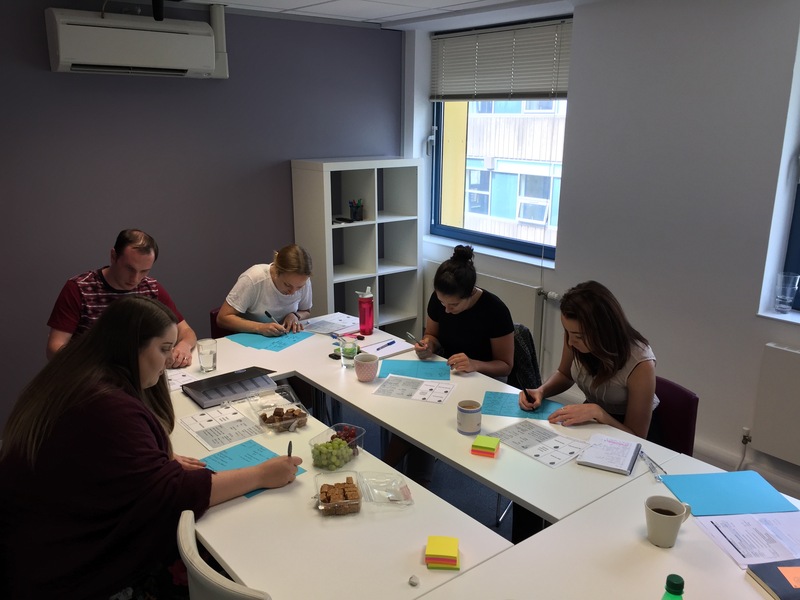 We wanted to further explore the themes that we uncovered through our interviews, and hypothesised that there may be different types of participants who have different behaviours and motivations for taking part. We didn’t feel that we could devise personas from the small number of interviews we had conducted. So we’ve designed a survey, as a low time intensive research method to explore further the themes that we discovered through our in-depth interviews. Having 5 in-depth interviews to inform our questions makes our surveys fairly robust, as we’ve been able to use words that we know participants use. Will participants only take part in certain types of research? What factors motivate participants to take part in research? Do participants segment on how they rank these motivations? How confident do participants feel about the research when it’s taking place? We’re researching about taking part in research that is conducted by researchers. (Meta, right?). We’re aware that we are user researchers, therefore we will carry a bias around how research should be designed and conducted. If we’re not careful we’re in danger in allowing our assumptions get in the way of describing the participant journey as we design research too, and we’re designing this piece of research. Due to this we have looked at opportunities to speak with other researchers, and this sprint we were able to interview another researcher who works for a small agency. This was really useful, and we found out some things that we would not have done had we carried our own biases. We spent a day at the People for Research office in central Bristol. We spent the morning hanging out with the team seeing what they did, how and why. Through observing the recruiters we learnt about the intricacies of building a rapport with participants. However, it’s not just recruitment that PFR get up to, they need to keep enticing new people to take part in research whilst also looking after their base of eager participants. In the afternoon we had the opportunity to run a workshop to probe further on what we had observed in the morning. The workshop attendees illustrated how they support the journey that a participant goes on when they take part in research. They shared with us their ‘war stories’ of recruiting participants which really added colour to what could be considered the actual start of research, much earlier than when the researcher formally runs on the camera. It was good to see today a conference dedicated to User Research happen in London. Sad not to be there but what did come out loud and clear was a message of design your research to be user centred. We couldn’t agree more.